Sunday, May 22, 2011 – In the spirit of our ancestors, honoring the memory of all those Youth who have died unjustly and in respect to all our relations, We the Six Nations Youth Movement are TAKING ACTION and RECLAIMING the old Police Station as the temporary site of the Onkwehon:we Youth Centre. This action declares: NO ONE SPEAKS FOR THE YOUTH BUT THE YOUTH, no matter their level of education or claim to knowledge, the wisdom and voice of the Youth can only be found in the Youth. We declare that the Band Council superstructure (including its services) cannot handpick our representatives nor determine the direction of the Six Nations Youth Movement. 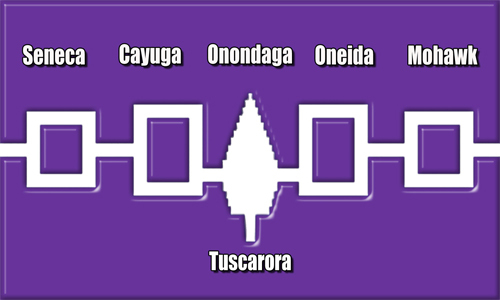 WE are the Six Nations Youth Movement, ALL of us together – not any one group or any one person alone. By reclaiming this site, we reclaim ourselves. This is not a violent delinquent or illegal act. We are reclaiming this site in the same spirit of the old council house, kanata, kanonhstaton. We are transforming this building from a site of oppression and colonization to one of empowerment and healing. We reject the idea of private property, which contradicts the principle of our stewardship to the land. By reclaiming this site, we are calling attention to the fact that still, after twenty years of campaigning, asking, pleading, there is NO YOUTH CENTRE on Six Nations , even after many attempts to work with Band Council. That process has taught us that to work with Band Council is to work under Band Council, and the Youth (and our Youth Centre) will no longer be controlled by that colonial system. We are creating a Youth Centre FOR the people and BY the people. We are not interested in collaborating with any colonial structures: Band Council, Police, CAS or corporations. We recognize the effects of colonization: trauma, suicide, abuse and violence against our people. We, the Youth, will no longer be tools of oppression against ourselves and our people: merely victims and statistics. From this day on, we will take up our responsibilities, move forward and carry on this struggle. We will not be silenced! We are reclaiming this site for a Women’s and Youth Sacred Fire, started from ashes collected from sites of struggles and ceremony all over Turtle Island. These ashes hold the memory and spirit of Site 41, Grassy Narrows, and many Full Moon Ceremonies; Sacred Fires which were lit and kept by Women. This fire is our strength and our healing. We are using these medicines to call YOU to the Sacred Fire. You, the Youth tired of waiting, whose voices have been silenced, Youth sick of pointless meetings, Youth with that warrior spirit living inside you. Whatever nation or territory, whether on-reserve or not, raised in our traditions or not, Handsome Lake or Great Law, down-below or upper-end WE NEED YOU! So after school, when you get off the bus, during lunch, on the weekends, whenever you can – come join us and SPREAD THE WORD! Join us as we finally take a stand as youth and show our nations, our people where the true power lies: within each and every one of us. Let us UNITE to start the process of fulfilling the PEACEMAKERS prophecy: for the Youth to stand up the Tree of Peace. To all Youth in all territories: TAKE ACTION, raise your voices and stand with us. We invite supporters of the Youth, adult allies, Elders, holders of our traditions and ceremonies and all of our people to the Sacred Fire. Come with your songs, drums, dances, teachings, food, wood, medicines. We need your support. We will be hosting socials, film screenings, concerts, speakers, etc. while at this site, so if you have any ideas or have nothing to do come down and be empowered. All are welcome. ALL POWER TO THE YOUTH! ALL POWER TO THE PEOPLE!! !